With just opening the bag and display of the comforter my son was carried away by its catchy print.Awesome color combination. The pillow is the highlight of all its shape and color duo is unbeatable. It is really soft and filled up right for the kids.The pillow cover are right sized without the need to fold unlike some other which are really big. The color combination of the comforter would really match up to any room color. Really happy with look and texture.The only drawback I faced was after wash and dry the filling inside the comforter in some portions got together and felt hard from outside and the cloth layer outside looked little crumpled. To be honest not sure if it is my mistake about the dryer setting. Waiting for the second wash to see if comes back to its original fluffiness. I really love to have it back as it so warm and cozy, I received this product at a discounted price in return for my unbiased review. Home territory searches the web to find the best prices and availability on Kids Bedding and related products foir your home like Better Homes and Gardens Kids Knight Grey Bedding Comforter Set. 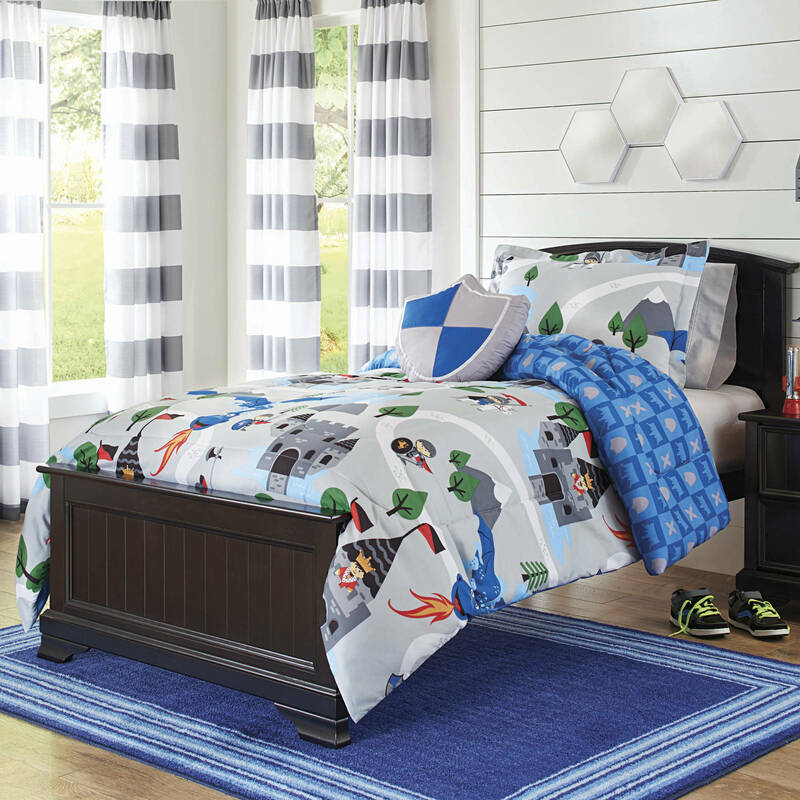 For this page, related items include products we find that match the following keywords: "Kids Bedding" at our vendor partner Walmart - Click More Info / Buy Now to check for price rollbacks!. Better Homes and Gardens Kids Knight Grey Bedding Comforter Set is one of 151 Kids Bedding and related products available for sale through HomeTerritory.com, If you have any questions on this product, please give us a call at 734-971-1210 during the hours of 9am - 5pm EST for assistance. Thank you for shopping at Home Territory, the home furnishings superstore!